By admin | April 22, 2016. Any gamer or vinyl enthusiast worth their salts will know about R.A.G.E. on Fade Street. 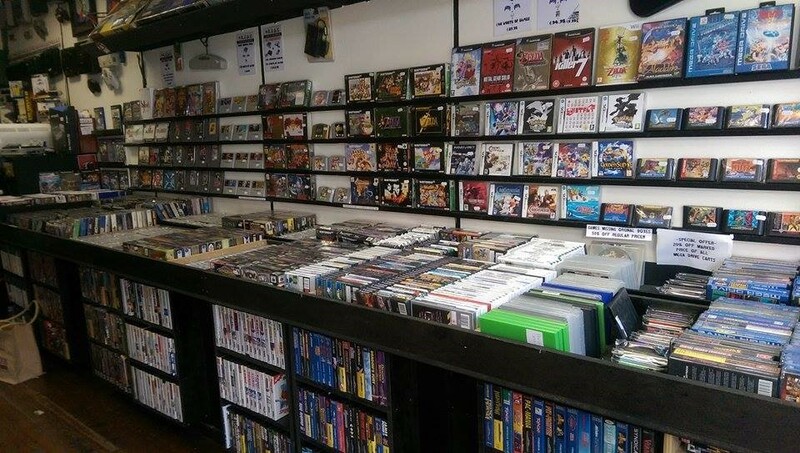 You can find vinyl records in a good few shops in Dublin because of this huge increase in popularity recently, even HMV have jumped on the bandwagon, but this is one of the few shops you can buy original old school games for consoles like the SNES. Games we haven’t seen on shelves since the ‘90s. In 2009, Nick Dimaio Set up a vinyl record shop called Road Records. Unfortunately the shop was closed down, but soon after he started another one in its place. It was surprisingly never Nick’s intention for his new shop to sell games, it was purely a record shop. Nick was a huge gamer himself, and he had a Super Nintendo (SNES, 1990) in the shop to keep himself entertained during quiet periods. So what happened was that people were coming in to buy vinyl, but the customers became more interested in Nick’s Super Nintendo and wanted to play with him. He spotted this trend of retro media because he had first-hand experience with those who were obviously really into these old games, so he took a chance on it, and now it accounts for more than half of his business. Ray Bioleau, the manager of R.A.G.E, explained the diversity of people who are drawn to the shop. “The demographic of people is a crazy sort of mish-mash, I mean you have vinyl enthusiasts who are up to 50 or 60 years of age, you have gamers who are much like myself; late twenties early thirties who are looking to relive the games of their childhood, and then you have a nice and ever increasing section of kids who are from 6 years of age to 17, and for whatever reason someone has introduced them to this old platform for games and music”. These young ‘retro’ gamers and vinyl enthusiasts are a puzzle to many, as they were never around when these platforms were popular, and so unlike the older generation, you can’t pin their interest down to nostalgia. Boileau has a theory on why these kids are into this strange hobby; “You actually have a lot of people who are maybe 40 years of age who are handing their vinyl down to their kids, and those kids are realising that there’s a whole new medium there and more artists than they could ever imagine. Not all of them will latch on, but every now and again some of them will, and it’s nice to see a kid here flicking through vinyl and actually understanding what they’re looking at. This generation has grown up with the internet, and we’re very knowledge hungry, we devour information much quicker than we ever did before simply because the information is available, and we have now everything in front of us. It’s very difficult to find original content, so you’ll find that the reason that young people are going backwards is because to them it’s new”. When asked if he thought that the shop would be in trouble once this fad was over and people moved onto some other ‘hip’ fashion, Boileau speculated that “in the bubble that we’re in at the moment I think potentially it’ll level out really as opposed to crashing, once this younger generation has started building a retro game or vinyl collection they’ll continue to add to it, it won’t just be left untouched”. Although, perhaps people won’t be willing to pay the price of a new game for an old one once this hype about retro media has died. With old school games and vinyl enjoying such a renaissance, it seems that people are dusting down those old record collections and games consoles that have spent the last decade or so lurking, unloved, in their attics.